Sierra Leonean striker Alhaji Kamara scored a winner for MLS side DC United on his return to action, three months after being told he needed to quit football because of a heart defect. The 22-year old came on as a late substitute against Sporting Kansas City to score with his first touch of the ball in a 1-0 win on his MLS debut on Friday. "Being out for six months and with all that has been going on, I feel really happy besides scoring the goal but playing in the game," Kamara said. "I want to be part of this team, I want to be part of the family, so it's just great," he added. Kamara's former club IFK Norrkoping, who are the Swedish champions, took him off their squad list for the season in February after it was detected that he had an usual heart defect that carries a great risk for sudden death at maximum effort. The defect was discovered when he underwent a mandatory Uefa heart examination as IFK Norrkoping were due to play in the Champions League qualifiers. Both Uefa and Fifa recommended that Kamara stop playing. But the Swedish league winner refused to give up and decided to undergo further tests in the United States, where it was found that he had no life threatening heart problem. The heart specialists who carried out the tests cleared Kamara to play in MLS, paving the way for him to be signed by DC United. 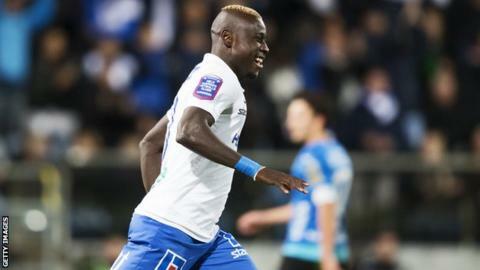 Kamara netted six goals to help Norrkoping win the 2015 Swedish league and was hoping to play Champions League football.